We are honored to partner with Woody Durham and his family. We are selling this tee shirt that has the standard Woody saying GO WHERE YOU GO AND DO WHAT YOU DO along with a representation of Woody Durham's signature. 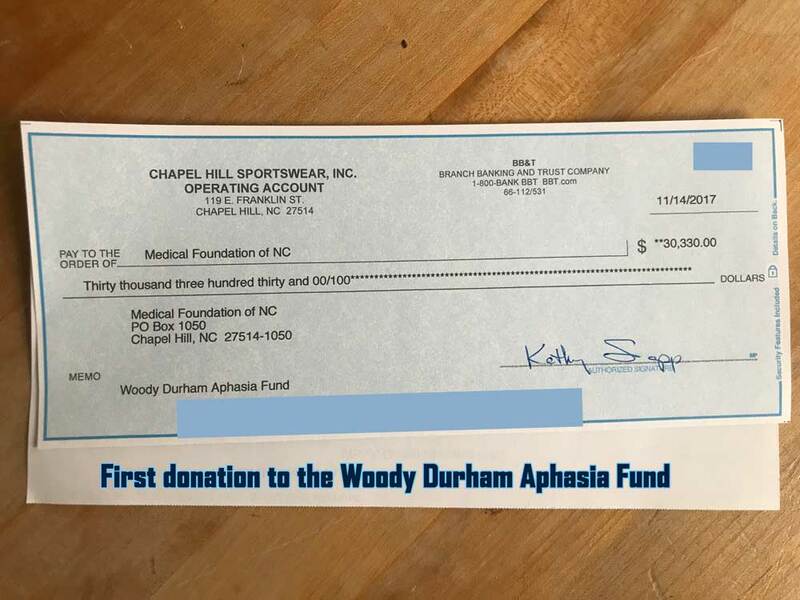 The entire $15 purchase price will be donated by Chapel Hill Sportswear to a fund that will generate money for Aphasia research and programs across North Carolina. The shirt is offered in Carolina Blue for Tar Heel fans and in a sport gray heather for Woody Durham fans that don't bleed Carolina Blue. Please use #HeyWoody to show your support for Woody Durham and this awareness campaign. Check back to this page for more details on other ways that you can support Woody Durham and his family in this endeavor.